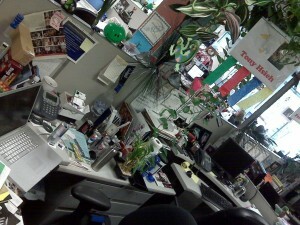 This is the desk of Zappo’s CEO/founder Tony Hsieh. It may be a humorous jab at old-school images of CEO desks. But maybe it reflects the realities of the modern Internet-enabled organization and executive. Heck, Netflix CEO Reed Hastings doesn’t even have a desk/office/cube… just walks around to his meetings or sits in an empty meeting room with his laptop on the wireless network.